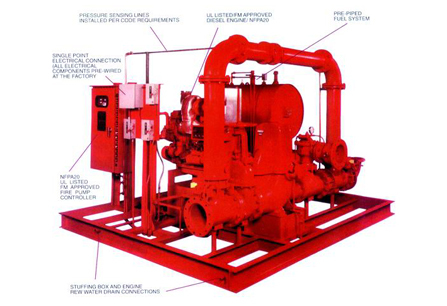 FIRE PUMPS MEETING NFPA STANDARD CAN BE SUPPLIED WITH FM APPROVED OR UL LISTED DIESEL ENGINE AND CONTROLLERS RANG OF SIZES. FLOW RATE UP TO 11OOO USGPM. PRESSURE RATING UP TO 450 PSI.